Welcome to the sixth issue of LABEL ALERT EXTRA - Scope Resources & Costs, a practical implementation guide to navigating Nutrition Label Reform. Feel free to forward this newsletter to your team members who will be instrumental to your success as you navigate this journey together. Download our complimentary Style Guide. Be sure to read Step 1, Step 2, Step 3, Step 4 and Step 5, if you haven't already, and stay tuned for our 7th and last installment: Execute Final Plan. 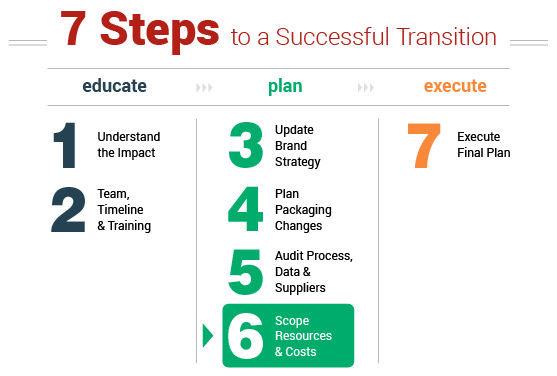 effective transition is to scope the workload, resources needed and costs - first by understanding what your task areas are, who is going to perform the work, then by estimating time to completion and budgeting resources & costs. Add IT & ingredient inventory infrastructure costs & allocate all costs across the two years left (FY 2018 and 2019).